Part I: what makes potential life on Titan such a challenge? As we have been repeatedly surprised by the discoveries made by our robotic explorers over the last few decades, it is certainly clear that our solar system is much more interesting and diverse than we ever previously imagined. There appears to be at least several objects among our cosmic neighbors that show promise as potential habits for life outside of Earth. Some of the prime real estate in this respect would be Mars, Jupiter’s moon Europa, and Saturn’s moon Enceladus. Both Europa and Enceladus show evidence of having liquid water, vast oceans in fact, beneath their frozen crust, and Mars most likely had liquid water on its surface billions of years ago, and perhaps still has liquid water somewhere below the surface. Even Venus may have been covered in water in it’s early history only to evaporate it’s oceans away due to an out of control green house effect. In addition to these, there are other candidates moons and even dwarf planets, that may be home to liquid water beneath a frozen surface, and therefore also a potential abode for living things. Everything we know about life on earth points to the importance of water in the origin and maintenance of life. If we find life on any of these worlds it will probably be “life as we know it”, in the sense of having a similar biochemistry to earth life with a dependance on liquid water. In fact, it would probably be a consequence of being water based that would contribute to the close similarities in molecules like DNA and proteins, that would most likely be present on a watery world. There may certainly be some important and interesting differences, such as using a different genetic code to specify amino acids, perhaps having a different chirality (i.e. Right handed amino acids instead of left handed ones), and possibly having a different set and number of amino acids, but the basics of DNA to code and store information and proteins made of amino acids to carry out metabolism, will likely look like a odd version of what we have here on earth. But, there may be one place in our solar system where the potential for “life as we don’t know it”, also has the potential to exist. That place is Saturn’s moon Titan. 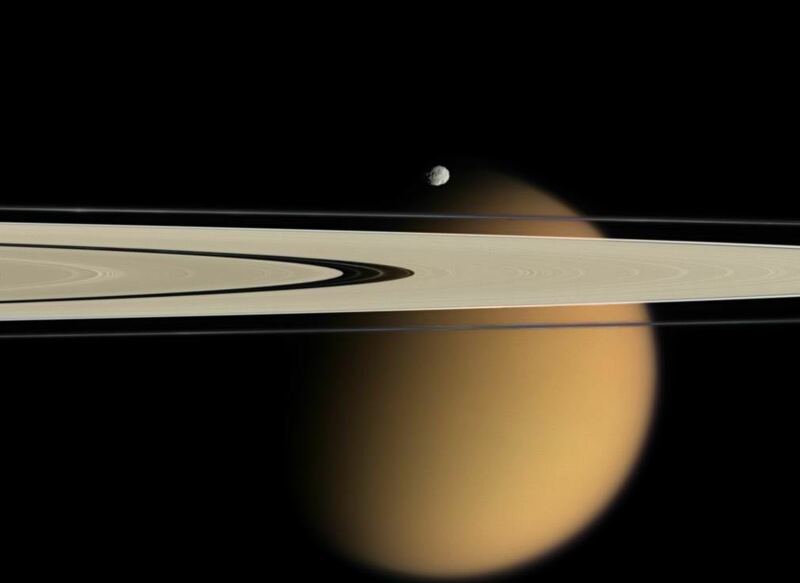 Titan is unique in the solar system in a number of important respects. For a moon its quite big, being the second largest moon in the solar system – only Jupiter’s moon Ganymede is larger. Titan has twice the diameter of earth’s moon. If it was in orbit around the sun instead of Saturn, it might be considered a planet unto itself. It is also the only moon with a thick atmosphere, as dense as the atmosphere down here on earth. Like Earth, the atmosphere on Titan is primarily nitrogen, but unlike earth there is no oxygen to breath. But perhaps the most remarkable thing about Titan is that there is liquid on it’s surface. Besides Titan, only the earth is known to have a large volume of surface liquid today. As we said before, Mars probably had liquid water on it’s surface billions of years ago that has since evaporated away. Of course, the earth has vast oceans of liquid water, but the liquid on Titan is not water, it’s liquid methane. There are lakes of methane, and evidence for rain and rivers of the stuff! We think that liquid is necessary for the chemistry of life to take place. In solids the molecules are too fixed to react much and gases are usually to dispersed for reactions to have a high chance of occurring, and are difficult to contain. A major difference between Earth and Titan, however, is that Titan is cold – really cold. 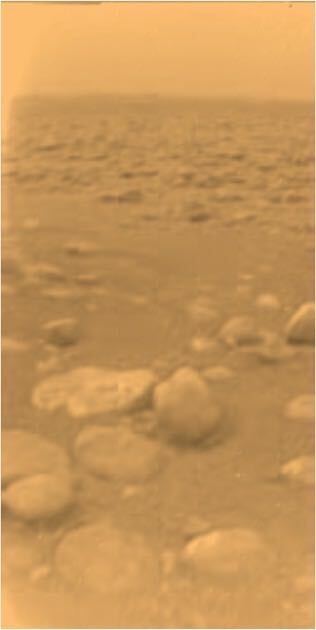 The surface temperature on Titan is -179.2 degrees celsius or -291 degrees fahrenheit. Now that’s pretty darn cold, and Titan would be even colder if not for the greenhouse effect of methane in its atmosphere. It’s both the extreme cold and the fact that methane is the liquid we have to deal with, that makes any type of biochemistry onTitan so challenging to consider. Water has properties that make it an ideal solvent to dissolve the molecules of life into solution. Could liquid methane serve a similar role on the frozen moon Titan? What would it take for life to find a way to use methane as a solvent for the molecules of “life as we don’t know it”? Let’s look at some of the possibilities for a methane dependent life form that lives in the conditions present on Titan. We will stick, as much as possible, to the rules of organic chemistry, but Warning, wild speculation ahead. Let’s first look at the major differences between water and methane as your choice of solvent. Every school child knows that water is H2O – made up of two hydrogen atoms covalently bonded to an oxygen atom. It is not a linear molecule, however, but has a bent shape. This creates an electric dipole moment in the molecule, meaning that one side of the molecule is partially negatively charged (the oxygen in this case), and the other end, facing the hydrogens, has a partial positive charge. The electric dipole moment can be measured and it’s value is placed in units of the debye (D), with water having an electric dipole moment of 1.85D. It is this dipole, combined with the fact that oxygen and hydrogen are extremely common throughout the cosmos, that makes water such and interesting, useful, and seemingly indispensable substance. Most organic molecules are electrically neutral – they have no formal charge – but many of the functional groups in the organic molecules do have an uneven distribution of electron sharing, creating a partial charge separation in the chemical bonds between certain atoms. For example, in the carboxyl group there is a partial negative charge on the oxygen and a partial positive charge on the carbon. This means that the carbon can act like an electrophile (attracted to electron rich atoms) and reacts with a partially negative charged molecule, and a nucleophile (attracted to an electron poor atom) will tend to react with the carbon. The reactions due to these kinds of attractive forces are called polar interactions, and it is these types of interactions that create interesting chemistry, and life is all about interesting chemistry. 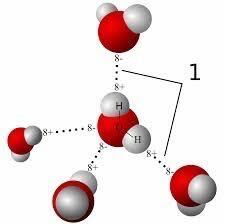 Water can form hydrogen bonds with other water molecules, as in the figure above. Because of waters dipole properties it will interact strongly with other molecules that contain polar covalent bonds, and this allows them to be soluble in a watery solution. This is energetically favorable for polar molecules, because even though they cause the hydrogen bonds of the water matrix to break as they take up space in the solution (energetically unfavorable), they then form polar bonds with the water to replace the broken bonds (energetically stable)- so in a sense, no harm done. This allows the polar molecules to be soluble in water solution, and this is what you want for your biomolecules if you’re a life form – soluble molecules, not ones that precipitate out of solution. Water helps to stabilize polar molecules and is very important for maintaining the proper shape and structure of important biomolecules like DNA and proteins. Non-polar molecules, on the other hand, really don’t do well in water and they will not go into solution. The non-polar molecules also break the waters hydrogen bonds since they have to fit in the water matrix, but since they are non-polar they can not replace those bonds, and so remain energetically unfavorable. They will tend to form a separate layer from water and stick together to minimize their interaction with water molecules. For this reason, the non-polar molecules are called hydrophobic, which means water fearing or water hating. Water is also great at dissolving important salts in solution, like sodium chloride (NaCl) for example. The polar nature of water will break the ionic bonds between the sodium atom and the chloride atom apart, and the sodium will be surrounded by a sphere of water with it’s partially negative oxygen atoms facing it, while the chloride will be surrounded by a sphere of water with it’s partially positive hydrogen atoms facing it. Inorganic ions from salts like sodium chloride, potassium chloride, calcium phosphate, magnesium sulfate, and others are vital to the workings of enzymes and stabilizing biomolecules. Would these ions be able to exist in a non-polar methane sea? Unlike most organic molecules, one group that is non-polar and water hating are the hydrocarbons. Methane is the simplest hydrocarbon, having just one carbon atom covalently bonded to four hydrogens. There is no dipole moment in the methane molecule. Carbon and hydrogen both have approximately the same amount of pull for the electrons. Even if that weren’t so, the symmetrical tetrahedral shape of methane would still cause the polar bonds to cancel each other out. Hydrocarbons with long chains of carbons are also non-polar. Propane is a hydrocarbon with 3 carbons and 8 hydrogens, and octane is one with 8 carbons and 18 hydrogens. Methane is the major liquid on Titan, with some ethane (2 carbons) thrown in for good measure. Hydrocarbons don’t undergo polar reactions. That’s one reason that they can remain liquid at such low temperatures where other organics would freeze solid – they interact so weakly that it is difficult to get them to interact enough that they become solid. These non-polar molecules do have their own very weak interactions, however. They are subject to non-polar forces called Van der Waals forces. These results from a weak induced dipole, as one molecule gets close to another. Say you have a mixture of methane molecules. There is no permanent dipole, but when the hydrogen of one methane gets too close to the hydrogen of another methane the electron of the first will repel the electron of the second one, and that creates a tiny fleeting attraction between the two molecules. It becomes more pronounced at very low temperatures where the heat energy of motion is not too great. At temperatures that we find comfortable, these minuscule interactions are easily overwhelmed by all the thermal motion. If you have very long hydrocarbons, or other non-polar molecules, then the combined Van der Waals forces acting along the different parts of the molecule can make the effect more significant. This would possibly be a very important force in any Titan life form. On Earth, Van der Waals forces certainly have their important places, and can be important in many DNA-protein interactions and some protein-protein interactions, but many of the interactions between biomolecules rely on polar chemistry to create covalent bonds, and this might be difficult to achieve for a living thing on Titan. In part II of this article we will examine two possible solutions for Titan biochemistry – What I’m calling The Non-Polar liquid solution (NPLS) versus the Polar-Non-Aqueous liquid (PNAL) solution, or the NPLS vs PNAL. By solution, the meaning can equally double as referring to either a mixture of a liquid with another substance or an answer to a problem – either works fine. Previous article	← Diseases with an upside!